Mini Maxi Special Edition Dresses in 2 different prints - Pre-order NOW! A divine dress for summer and made from bamboo and spandex it is super soft and comfy. Wear to a party or just throw on to go to the beach. 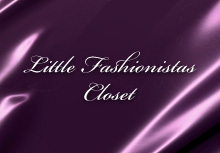 Dress your little girl like a celebrity in this LIMITED EDITION Polka Mini Maxi dress that is preferred by Suri Cruise. 1. Pre-order the Mini Maxi Dress in Blue Diamond print here for only $89.95! Bib SS Diamond Top in the same print is available here. 2. Pre-order the Mini Maxi Dress in AZTEC print here for only $89.95! 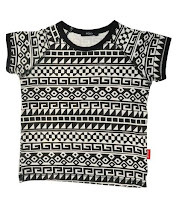 Me Aztec - Tee in the same print is available here. Suri breaks out her gold pair of high heels for some shopping with Katie as the two visit a Halloween store on Monday, 26. 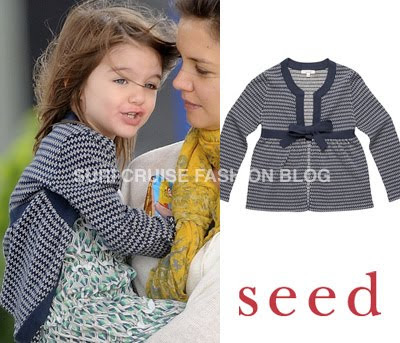 Suri is wearing a dress from Holme & Yang Collection and a Facet Button Cardigan in Cherry by SEED. 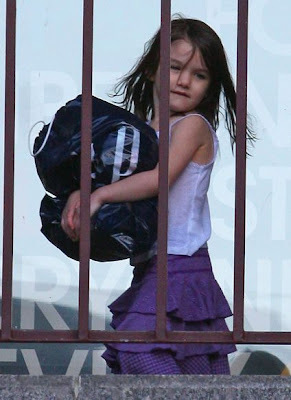 In the afternoon, S&K visited dad on the set of “Knight and Day”, and Suri donned her new Halloween costume a few days early to show Tom. 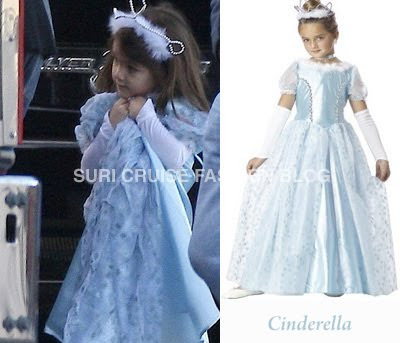 Suri is wearing Cinderella Costume available at Costume Craze. Thanks to Mandee for the costume id! 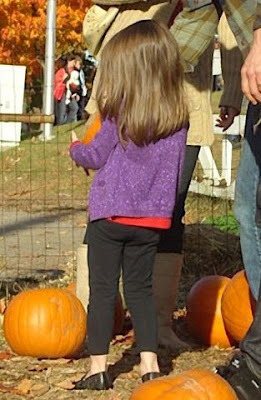 Gearing up for the Halloween holiday, TomKat and Suri paid a visit to the Brooksby Farm in Massachusetts on Sunday, 25. 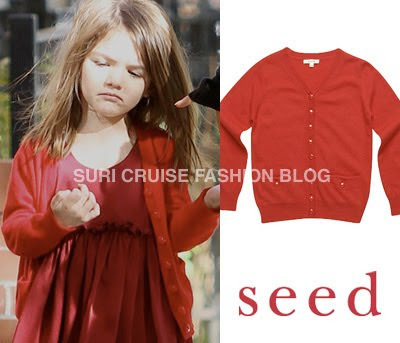 Suri is wearing Lurex Knit Cardigan in Jewel by SEED, which she first wore on October 4th. 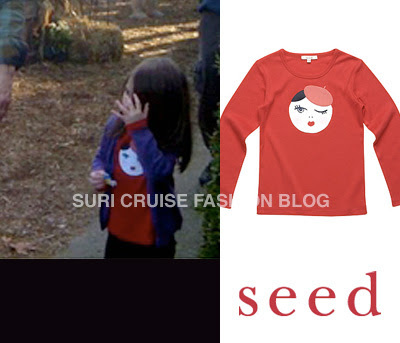 Suri is also wearing Parisian Lady Appliqué Tee by SEED. and a pair of Safir Leather Studded Pumps in Black by Maloles Petit. 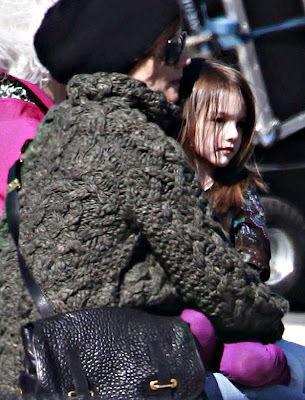 Suri & Katie visit Tom on the set of his new movie, “Knight and Day” (renamed Wichita), in Woburn on Saturday, 24. Suri is wearing custom-made Red Patent Ballerina Shoes by Roger Vivier, which she first wore on October 7th. Suri is wearing Knit Flower Dress from FW'09 line by SEED. Suri & Katie go running together again in Boston, on Tuesday, 13. Suri is wearing Micro Fleece Zip-up Hoodie in Turquoise by GAP, which was recently purchased on their shopping trip to GAP store. 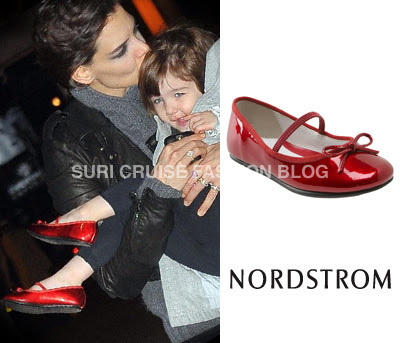 and Suri is wearing her trusty pair of Bella Ballet Flat in Candy Red by Nordstrom, which she firt wore on November 20th. 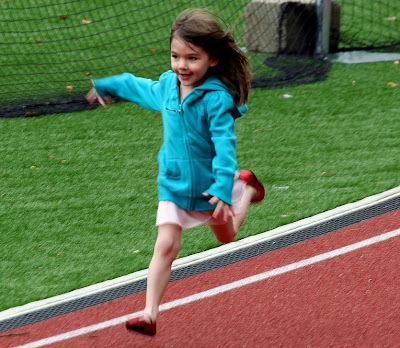 Suri & Katie are keeping fit by running at a track field in Boston on Monday, 12. While Katie was eager to play the role of track coach to her three-year-old little girl, she quickly switched into mom mode when young Suri took a tumble and hurt her knee. 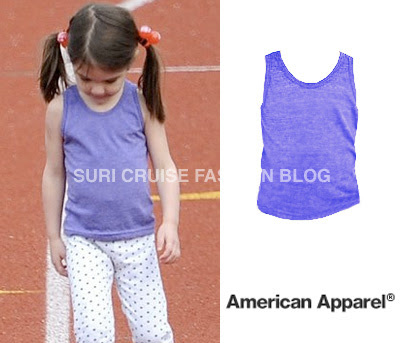 Suri is wearing Tri-Blend Tank in Orchid and Jersey Legging in White + Black Polka Dot, both by American Apparel. and Suri is also wearing a pair of Nike Air Force I LE in White/Metallic Silver-Orion Blue, which was purchased during their recent shopping spree at the Nike Town. 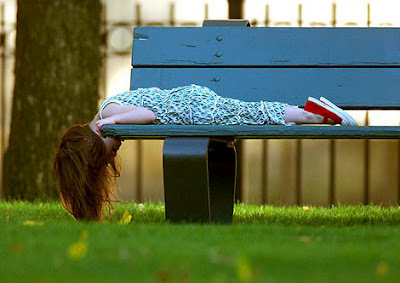 Suri & her parents took a walk around Boston and picked up coffee at Starbucks on Sunday, 11. Suri is wearing Pink Ruffled Dress from SS'09 Collection by Juicy Couture. Suri & her parents spent the afternoon exploring the beautiful park of Cambridge, Massachusetts on Saturday, 10. Later on the ladies were walking around the town and enjoyed some cupcakes at Sweet Bakery in Harvard Square. Suri is wearing Mini Maxi Dress by Polka(Australian brand) and Diamond Jacquard Tie Cardigan in Navy by SEED. 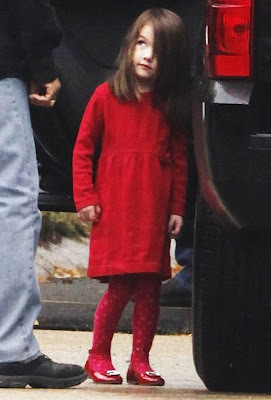 Suri is also wearing Red Lady Bar Shoes by Jacadi, which she first wore on September 28th 2008. 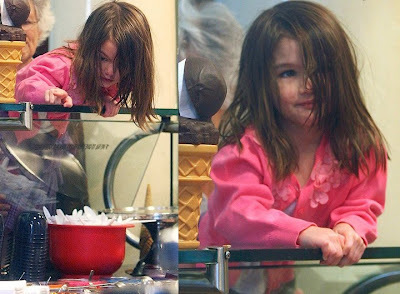 Suri spotted shopping at Nike Town with mom Katie and grandma Kathleen on Newbury Street in rainy Boston on Friday, 9. 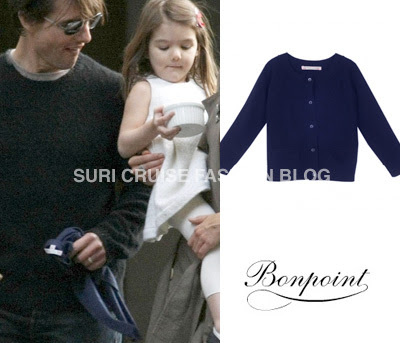 Suri is wearing Merino Wool Cardigan in Navy by Bonpoint, which we first spotted on August 12th. Suri is wearing Silk Ruffle Dress by Tiddles & Chinch - Australian Brand, which she first wore on August 14th. Suri has on a super-cute pair of Ladybug Rain Boots by Kidorable. 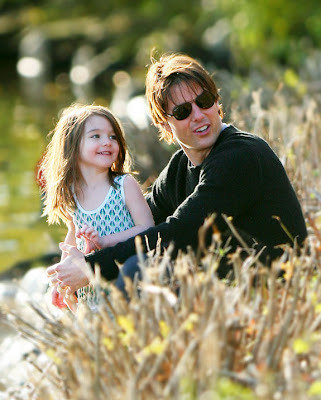 Suri spend some time with her mom, Katie Holmes, and dad, Tom Cruise, on the set of Wichita on Thursday, 8. 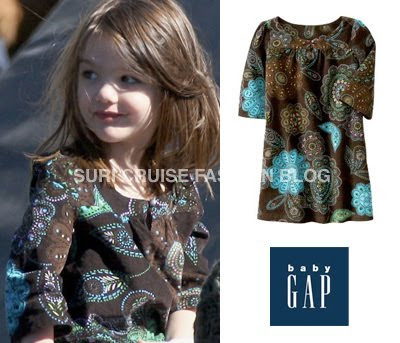 Suri is wearing Brown/Turquoise Print Corduroy Dress from Kid Girl Chelsea Collection (Fall'09) by GAP. ans Suri is also wearing her favorite pair of Barbara Patent Sandals by Maloles Petit, which she first wore on October 4th. Suri wore this Mini Mix n Match Skirt from SS'09 Collection by Mini Metalicus, while shopping in Boston on October 7th. Experimenting with stocking fabric in 1992, Melbourne designer Melma Hamersfeld transformed one stretchy piece of material into a concept for the international fashion brand - Metalicus. As the brand has developed, so has the product offering and today our collection includes Cotton, Wool and Bodytight. 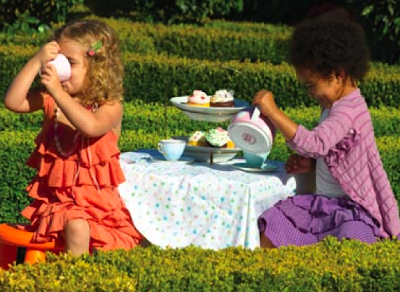 In 2003, Mini and Miss Metalicus arrived with the concept of 'stretch as you grow' to cater for tots and tweens. full catalog for SS'09 Mini Metalicus Collection is available here. This Skirt is available in-store only at the moment. The Mini Mix n Match Pinafore dress in the same print is available online here. Thanks to the anonymous reader for the id! Suri goes shopping at the GAP with her mom Katie and grandmother Kathleen at Quincy Market on Wednesday, 7. The three generations of girls also picked up a few sweet treats at Sprinkles ice cream shop. 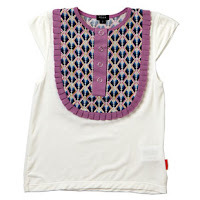 and White Lace Girls Vest by Petit Bateau. After leaving Gap store, Katie is holding newly purchased Micro Fleece Zip-up Hoodie in Turquoise by GAP. 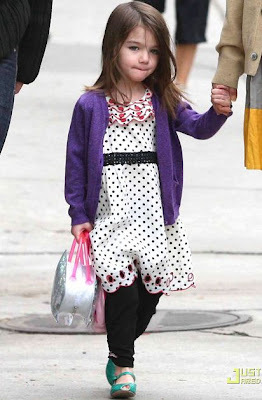 Suri & Conor have a lunch with their parents at Charley’s Eating & Drinking Saloon on Newbury Street on Sunday, 4. Cruise Family later visited the Nike store to pick up a few athletic items. Suri is holding Air Jordan 1 Phat Low in Black/China Rose by Nike. and Barbara Teal Patent Sandals by Petite Maloles. Suri & Katie spent the day on set of the "Wichita", where Tom was shooting car stunts, on Frinday, 2.